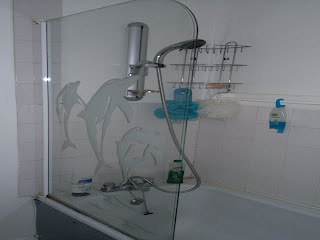 I noticed this glass shower splash panel thingy in a bathroom at some friends' house, and it got me thinking... If people stick bird-silhouette decals onto patio doors to stop birds flying into them and braining themselves, maybe the idea here is to prevent dolphins knocking themselves out as they get out of the bath. Perhaps.